An awe-inspiring and plentiful real Australian arrangement using highest quality native flowers and plants. 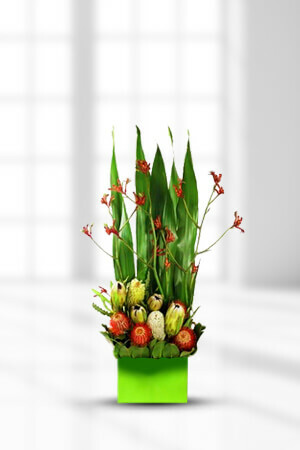 With characteristic outback colours, this piece really will impress hugely on the receiver who loves Australian Flora and will light up any surroundings.Add to the excitement of receiving this unique arrangement by adding a superior box of chocolates to your order. It will elaborate the gift however; can not guarantee they'll outlast the flowers! Easy to understand website. The person I spoke to was very helpful, and the flowers were delivered promptly in another state. My family said the flowers were just lovely. So it was a very positive experience in every way. I randomly selected you from the net, however the service was very professional and your company delivered on their promise. I would definitely use you again. Very good. Ordered from NZ, the day before, delivered as requested. choices were very good, delightful some of them, and prompt feedback was good.